“Just last week we uncovered efforts by Hezbollah, an Iranian proxy, to build a military network in Syria, in the Golan Heights. All of you can imagine what would have happened if Israel were not in the Golan: We would have Iran on the shores of the Sea of Galilee. I think, for this reason, and many more, it is time that the international community recognises Israel’s stay on the Golan, and the fact that the Golan will always remain part of the State of Israel”, Netanyahu said. PM Netanyahu: "It’s time that the international community recognizes Israel’s stay in the Golan, the fact that the Golan will always remain part of the State of Israel." — PM of Israel (@IsraeliPM) 20 марта 2019 г. 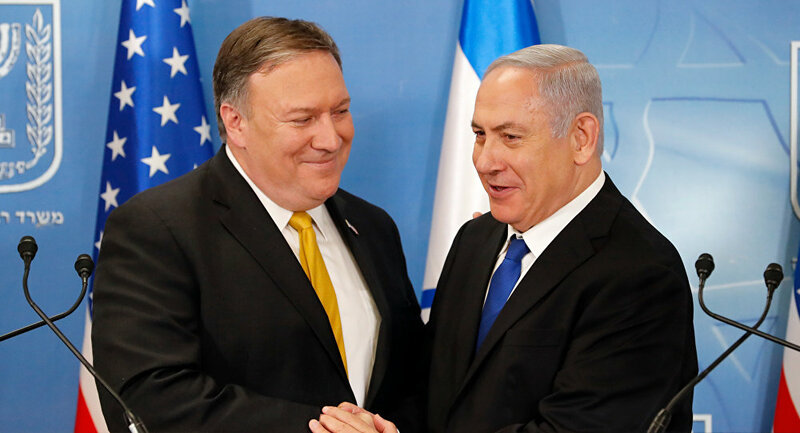 The Israeli prime minister then praised Pompeo for being an “extraordinary champion” of the US-Israel alliance, and expressed gratitude to the US secretary of state and President Donald Trump for their efforts to support the partnership by moving the embassy to Jerusalem. Pompeo, in turn, responded to his remarks by saying that “Israel has a special place” in his heart. — Department of State (@StateDept) 20 марта 2019 г. Just a week ago, the US State Department referred to the Golan Heights as “Israeli-controlled” rather than “Israeli-occupied” in its 2018 human rights report on Israel, the Golan, the West Bank and Gaza. The reference came in contrast with earlier reports as a sign of Washington’s growing support for Israel. Last week, US Senator Lindsey Graham told Netanyahu that the Golan Heights should remain Israel’s territory and that he would push the US to formally recognise it. His bid came a month after Republican Senators Ted Cruz and Tom Cotton, along with Rep. Mike Gallagher, introduced a resolution to “ensure that Israel retains control of the Golan Heights”. Additionally, last year the United States stood up against a resolution by the UN General Assembly that declared Israel’s decision to extend its legislation on the Golan as null and void, and urged Tel Aviv to end the occupation of the contested area. The Golan Heights were seized from neighbouring Syria by Israel following the 1967 Six-Day War, but it wasn’t until 1981 that Israel formally passed legislation annexing the region. The law failed to gain international backing, and was criticised by the UN as illegal, with the US also refusing to recognise the move. Reacting to the condemnation, Netanyahu has repeatedly emphasised that Israel would not agree to meet Syria’s demands and retreat to the 1967 lines, because they were “indefensible”. The prime minister also stressed that the Golan Heights would “remain in the hands of Israel forever”.